EVLT Laser and accessories for the Treatment of incompetent saphenous veins. he principle of Endotherme 1470 is based on the thermal effect of the laser: it’s athermal ablation of the vessel wall. 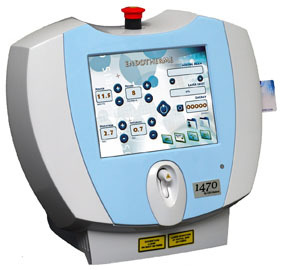 The 1470nm, which has a higher absorption in the tissues, improves the post-op comfort for the patient, while ensuring the optimal efficacy of treatment. The Ringlight radial fibers, with the encapsulated tip, smooth and atraumatic, avoid perforations of the vein wall. Radial emission leads to an homogeneous destruction of the vein wall exclusively. Exist in Standard 600µm and Slim 400µm versions. Continuous or Pulsed, 0,1 à 25 sec.